Demolition contractors share a snapshot of the realities, challenges and opportunities facing the industry today in this special report. The demolition industry is always changing. At Construction & Demolition Recycling (CDR) magazine, we take pride in helping chronicle these changes by reporting on the latest in economic, legislative and business trend news to give readers a real-time glimpse into this vital sector of the U.S. economy. With this in mind, we’ve developed the 2018 State of the Demolition Industry Report. This report, which was compiled through a proprietary CDR survey of demolition professionals working throughout the United States, offers a snapshot of the realities, challenges and opportunities facing contractors today. This information has been supplemented by feedback gleaned from a closed-door State of the Industry roundtable discussion CDR conducted with a collection of industry leaders at the 2018 National Demolition Association (NDA) Conference in February. Together, these initiatives paint the picture of an industry that is simultaneously being propelled by historic tailwinds and weighed down by some long-standing pain points. Keep reading to check out the full report. According to the company, the robot offers four times the power of a hand lance in a compact footprint that contractors can easily move around the job site. Aquajet Systems AB, a Holsbybrunn, Sweden-based provider of hydrodemolition robot equipment, announced it will launch its Ergo System in the United States at World of Concrete 2019 taking place Jan. 24-25, 2019 in Las Vegas. According to the company, the robot offers four times the power of a hand lance in a compact footprint that contractors can easily move around the job site. It is ideal for work on floors, walls and ceilings. The Ergo System incorporates the controller unit, which powers and controls the hydraulics, the Ergo Power Head, which manipulates the high-pressure lance, and either the spine or the climber, unique systems used to support and maneuver the power head based on project needs. The climber attaches to any standard scaffolding pipes and robotically moves along to deliver powerful hydrodemolition forces for vertical concrete removal and repair, such as in high-rise construction applications. The system exerts 1,000 newtons of reaction force, which is about half of the force employed by Aquajet’s largest hydrodemolition robot, the Aqua Cutter 710V. The robot can handle higher volumes of water, as much as four times greater reaction force than a human operator with a hand lance, the company says. This means the machine can remove concrete faster and easier. Contractors can easily move the 271 lbs. Ergo Controller unit around the job site and over soft or rough surfaces due to the wide wheels and low ground pressure. At just 44 inches tall and 17 inches wide, the Ergo transports easily on a pallet. Additionally, the system is also service friendly with hydraulic hose multiconnectors that are 100 percent sealed from moisture to virtually eliminate the risk of leaks during transportation. The Ergo System requires a high-pressure pump to operate. Aquajet offers a compact Power Pack ideal for the purpose, featuring a high-pressure Hammelmann pump, diesel engine and an integrated control system. Aquajet will showcase the Ergo System in booth C4249 at World of Concrete 2019 in Las Vegas. Hino Trucks announced its new XL Series was recently featured at the American Towman show in Baltimore. This past spring, Hino Trucks, Novi, Michigan, announced the expansion of its product lineup with the introduction of the all-new XL Series. These Class 7 and Class 8 trucks were recently featured at the American Towman show in Baltimore with a fully equipped Century 3212 G2 medium-duty wrecker and an LCG16 Series carrier from Hermitage, Pennsylvania-based Miller Industries. The Hino XL7 and XL8 models are powered by Hino’s A09 turbo diesel 8.9-liter inline 6-cylinder engine boasting a B10 life of 1,000,000 miles. The lineup also features new active safety solutions with electronic stability control (standard on tractor) and collision mitigation systems, innovative payload management suspension options, and a optimized design that was also engineered for maximum ease of serviceability. Production of the new Hino XL7 and XL8 trucks will start in early 2019 and will be assembled in Mineral Wells, West Virginia at Hino’s new 1-million-square-foot production facility. The Hino XL Series has been coupled with the versatile Century 3212 G2 that is designed with the capability of towing a wide range of vehicles, from passenger cars, vans, city tractors and motor homes. With multi-positional rear jacks, dual 15,000 lbs. planetary winches and a 16-ton recovery boom, the Century 3212 G2 unit was designed to handle a wide variety of recovery jobs. Also on display at the American Towman show was the Hino XL Series with a Miller Industries 16-Series LCG (Low Center of Gravity) carrier. The patented design lowers the deck height 5 to 6 inches over conventional carriers. The lower height allows for the transport of taller loads such as forklifts or manlifts that maybe over-height on a conventional carrier as well as provides better stability during transport, the company says. The Hino XL Series will be offered in a host of straight truck and tractor configurations ranging from a gross vehicle weight rating (GVWR) of 33,000 to 60,000 lbs. and gross combination weight rating (GCWR) up to 66,000 lbs. with max performance of 360 horsepower and 1,150 lb.-ft. of torque. USBGC announced the updates during its Greenbuild International Conference and Expo. Thousands of members of the global green building community gathered at the Greenbuild International Conference & Expo, presented by the Washington-based U.S. Green Building Council (USGBC) and owned and operated by London-based Informa Exhibitions, in Chicago Nov. 14-16. The theme for this year’s Greenbuild was Human X Nature, representing how the green building movement embraces all of humanity by making sustainable buildings and environments accessible to everyone while benefitting the natural environment all around us. USGBC President and CEO Mahesh Ramanujam also gave remarks highlighting plans for the future and USGBC’s role in creating a new living standard for all people. “In the past, we have delivered on our promises of certifications, signifying high-quality spaces in which we can live and work,” Ramanujam says. He added that USGBC will harness its partnerships to explore the creation of a new campaign called Living Standard, which will indicate that an environment is healthy and safe to live in. LEED Transit Rating System – USGBC recently released LEED green building certification standards for new transit stations. LEED Transit was developed with valuable input from the Delhi Metro Rail Corporation in India (DMRC), Shanghai Shentong Metro Group Co. Ltd. for China (Shentong), and Shanghai Green City Architectural Technology Co., Ltd. With LEED Transit, transit owners can reduce their environmental footprint, while also engaging riders on the importance of sustainability and the opportunity the public transportation sector has in minimizing greenhouse gas emissions. LEED Zero Certification – USGBC officially introduced a new LEED Zero certification offering. The new program recognizes buildings or spaces operating with net zero carbon emissions from energy consumption and occupant transportation to carbon emissions avoided or offset over a period of 12 months. LEED projects can achieve LEED Zero certification when they demonstrate any or one of the following: net zero carbon emissions, net zero energy use, net zero water use or net zero waste. Integration of STAR and LEED for Cities and LEED for Communities – It was announced that the STAR Community Rating System, which offers certification for sustainable communities, has been fully integrated into USGBC’s LEED for Cities and LEED for Communities programs to help advance sustainable cities and communities worldwide. There are currently 75 cities and communities that have achieved STAR certification and 20 additional cities and communities that are seeking STAR certification. All of these localities will transfer into the family of LEED for Cities and LEED for Communities. LEED Recertification – USGBC announced that it will begin offering LEED recertification. All LEED projects – past, present and future – are now eligible for recertification by providing 12 months of data, powered by Arc, that shows consistent or improved performance using the most recent version of the LEED rating system. This recertification will be valid for three years and is an important step in ensuring that a green building is operating the way it was intended. The week of Greenbuild also included green building tours around Chicago; three day-long immersive summits; the sold-out Women in Green luncheon; recognition of sustainability all-stars at the Leadership Awards Reception, including the announcement of 25 new LEED Fellows and this year’s USGBC Leadership Award recipients; and a 600-vendor expo hall that featured a Net Zero Zone and dozens of inspiring signature events and education sessions. Greenbuild concluded with San Juan, Puerto Rico Mayor Carmen Yulin Cruz and Chicago Mayor Rahm Emanuel, who was recognized by USGBC for the City of Chicago’s LEED Platinum certification. Greenbuild 2019 will take place Nov. 20-22 in Atlanta at the Georgia World Congress Center. The call for proposals will open in December 2018. Sensor technology is allowing waste haulers to maximize loads and reduce unnecessary trips. Stanford University is in the heart of Silicon Valley, a place where tech is king. So, it should come as no surprise that the university’s waste services provider would leverage the industry’s latest technology to increase efficiency and reduce unnecessary pickups. Peninsula Sanitary Service Inc. (PSSI), Stanford, California, provides the 8,180-acre campus with containers it dubs “debris boxes” to take the waste generated from the school’s ongoing construction and demolition projects and from the moving in and out of the college’s 13,000 students at various times of the year. PSSI carries four roll-off box sizes in 8-, 15-, 20- and 30-cubic-yard capacities. The 15-, 20- and 30-cubic-yard boxes also come in short and tall heights. In all, 52 debris boxes are strategically located across campus and are serviced by roll-off trucks as needed. Keeping track of, and knowing when to service, each container takes a lot of time and effort. That’s why Andrew Pellegrini, operations manager at PSSI, decided to look for a technology solution that could help. Luckily, being so near a plethora of tech companies, he didn’t have to look far. He found Compology, based in nearby San Francisco. The company, in partnership with Charlotte, North Carolina-based Wastequip, offers a container monitoring system for waste containers. “We always try and look for advancements in technology,” Pellegrini says. He notes that the data collection capabilities of Compology’s system were a major factor that helped PSSI settle on them as their equipment provider. 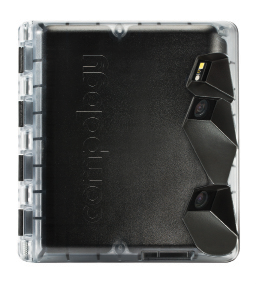 The Compology system includes camera-based sensors and a web-based dashboard that allows Peninsula to track container location, fullness and motion throughout the university. 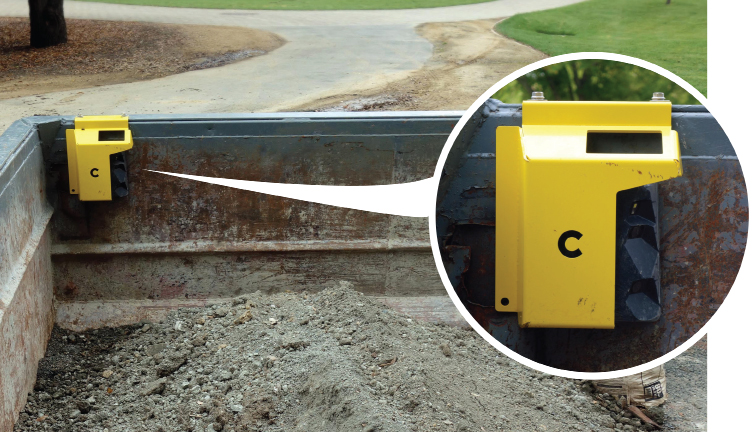 About two years ago, Peninsula had Compology sensors installed on all of its 104 debris boxes. One way the sensors have helped is through the ability to service boxes more quickly since drivers are only servicing boxes that need it. However, Pellegrini says that if a customer calls and wants a box serviced, the technology can also help increase efficiency since the driver can likely fit it into his or her schedule that same day, whereas before, it may have taken a day or two to fit it into a driver’s schedule. Keeping track of inventory has been simplified, too. Pellegrini says during a large demolition job going on at the campus, the demolition contractor decided that, rather than use the typical high-side end-dump trailers, it wanted to use the debris boxes. On the container page of the software platform, he can look at pictures of the box as it gets filled up. There is also a dispatch page for the paperless option on the tablets Pellegrini’s drivers carry. Nationwide, Compology has about 5,000 sensors deployed. Ben Chehebar, Compology co-founder and chief product officer, says the company’s customer base ranges from small cities to companies managing close to 1,000 containers. The sensors are typically installed inside the back of the roll-off container close to the rim. On front-load containers, they are typically placed inside on the door or in the front of the container. An accelerometer in the sensor also measures and records when a container gets picked up and put down—proof that the container has been serviced. The sensor’s camera automatically takes photos of the entire contents of the container. This also provides service verification by comparing the pre-service photo of the full container to the post-service photo of the empty container. Image-based sensors also deliver the change in fullness percentage as a third point of service verification. Compology can also use GPS to track the location of roll-off containers from the customer’s coordinates to the coordinates of the disposal facility. Chehebar explains that, beyond just verification, on the front-load side, drivers can reduce the number of pickups they are making: “Measuring fullness is a way for a customer to cut costs,” he says. He adds, on the roll-off side of the business, a scrap metals hauler can make money off the resale of the material in the container. In this example, fewer pickups mean maximizing the revenue from material in the load, less labor and reduced fuel costs. On the customer service side of the waste business, Chehebar says it is using fullness monitoring to notify customers that a container is full and that a pickup is needed. For large construction sites, he adds, using the monitors is a way for a foreman to make sure there is enough capacity in the containers since that foreman can’t be everywhere at once. From the end-user perspective, Compology takes the need for self-monitoring away since the hauler can do all the work instead. Chehebar says this is just one area of the business that is expanding as the company continues to work on newer, more sophisticated monitoring systems. After starting the company more than five years ago in his parent’s garage, Chehebar says the company has grown to a full staff working out of its San Francisco offices. Now with thousands of sensors out in the field, the company has rapidly expanded to keep up with demand, making it a true Silicon Valley success story. This article was originally published in the September/October 2017 issue of Waste Today, a sister publication of C&DR.